Hi. I just joined the no. 1 guild horde side on my server. I applied as guardian, but they took me as balance. I started gearing for it right after that. But soon enough I found my dps to be really low compared to others with my item level (682 as boomy). I did 24k dps on black rock foundry heroic ka'graz, han'Sgar and kromog. I did 38 on darmac (thanks aoe). After this raid I was really disapointed about my dps and tought it was the fact that I still had agility gear on me. The log I have today is a training dummy one wiht intellect and food buff. Thanks to help me understand what I am doing wrong! First of all - we can't help you without logs. We cannot tell you what and when you've casted. - You do not have neither t17 nor t18 set bonuses. - You miss legendary ring. - Your gear isn't enchanted toply. What you should do to help your dps, is to farm some apexis and get 695-ish weapon from tanaan. Secondly - no offense but your UI looks quite crappy. As a boomkin it gets hell of a lot easier if you can put all things flat out where you can see them clearly at all times. Trust me on this one. And what you want least - is to be looking at your skillbars. Just do not do that. However this part is all about personal preferences, if you can manage not to fail with what you have - it may be just good enough for you. Well your UI looks better. However I would move CA and Inc away, they're not as important to track whole time as your dots. As for your dps - you've got your opener wrong. - Prepot + Starsurge (You will not pull if you're at max range, as starsurge has travel time. On your last CA GCD you could refresh your dots. It's not required, but helps you a bit. Next - you need to work on your Starsurge usage. I've taken a look at Iron Reaver fight. You had 3 initial charges, fight lasted 4:58 which gives you 9 more charges, and had 20 Shooting Stars procs. It totals 32 Starsurges, but you've only used 22. In solar you should use starsurge if you've got 2 procs, or about to get second. In lunar eclipse you want to use as much as you can manage. And of course you must use starfire/wrath buffs that Starsuge gives you. Another thing is dot uptime. You had really poor uptime on Sunfire. It seems that it's hard for you to track. For my stuff tracking I've made this http://i.imgur.com/GSPwRMV.jpgCA and Inc shows buff time when I use them, or they hide if their CD is more than 30secs. Back to the dots - You want to refresh your sunfire everytime you enter solar and moonfire every second time you enter lunar. Optimal time to refresh the dot is just after you enter, or before you leave eclipse. However if your dot drops - just refresh it anytime. Plus since WoD our dot's add some their duration if you apply new one. It's 12 secs for moonfire and 7.2 secs for sunfire. I could get into more details but you should work on this stuff first. 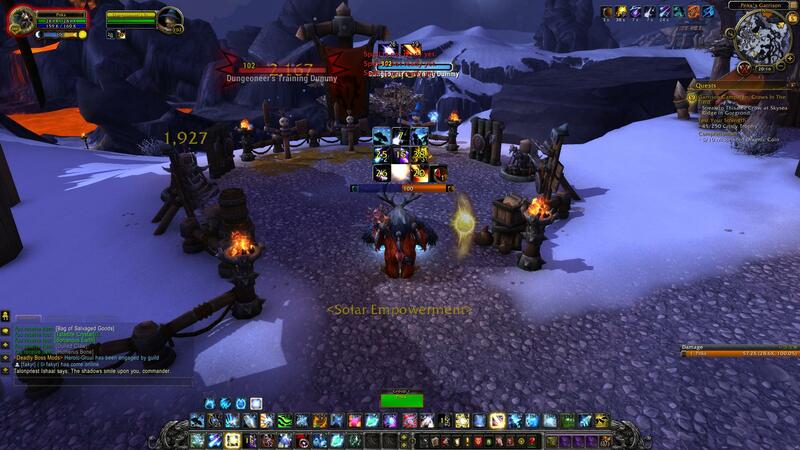 Once you get this going smoothly your dps will go up a lot, and then you can get into finetuning your rotation. Thanks alot again! That help me alot. The only question I got is when you say refresh moonfire in second lunar eclipse. You mean when I leave it or like lunar then solar then it goes back to lunar and I refresh it? Thanks for your help again and have a great day! Oh okay now I get it thanks alot!